While I do not actually sleep in my car except on rare occasion, my daily life is all packed in my vehicle. 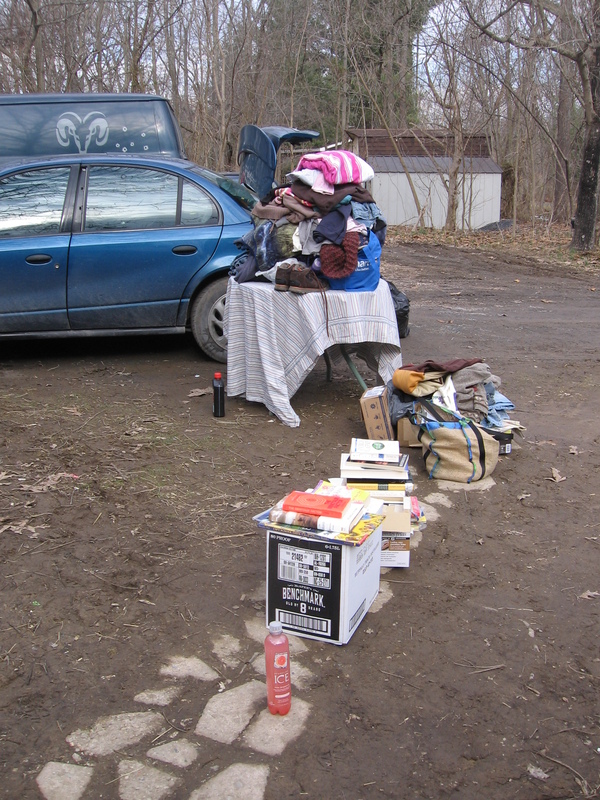 This is a photo taken on one of the days when I re-packed my car. My little Saturn is my closet, dresser, pantry and bookcase. Because I sleep several different places and have nowhere to leave my things, I carry them all in the trunk and backseat of my vehicle.Quilt, pillow, blanket, towels, soap and shampoo, jackets, clothes, shoes and boots, toiletries, vitamins, bottles of water, some food and a plethora of books travel wherever I go. As well as jumper cables, some small hand tools, paper towels, paper plates, plastic silverware, some rope, paper, pens and pencils and a pencil puzzle and word game book (not Dell, I am still unhappy with them). I am better at packing, but things still tend to get messy and out of place every couple weeks. So I sleep on the living room floor at my daughter’s. Their house is very small, about 960 square feet. They have two bedrooms (one for my daughter and her hubby and one for my 16 year old grandson), a tiny office, a living room open to the little dining area, a galley kitchen behind which is room for the washer and dryer. That’s it. There is a folding table with a desk chair for my computer in a corner of the living room away from the tv area. I have a few books and my computer there, and that is my spot. A stool next to the table holds a couple changes of clothes. There is no extra closet. So except when I am washing dishes, or cooking when my daughter works late, or down at the barn taking care of the animals, this is where I am. I can hardly wait for the weather to get a little better so I can sit out in the front lawn on a bench and read. I so miss having any space of my own. It is long years without any. No bedroom, no room at all. Yet I am grateful that I am not outside in the cold and snow. Day after day, month after month, this is my life – the life of a homeless person with an address. One of those who falls through the cracks.